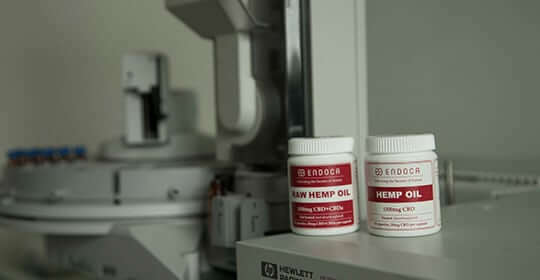 At Endoca we believe in thorough testing and not just percentages of CBD. A good lab analysis needs to check for pesticides and heavy metals, microbial organisms, fungus, mould and other impurities along with CBD percentages. Simple, transparent, and honest. We test all our products through each stage of the manufacturing process. We test our seeds, we test our hemp plants while they are growing in the fields and we test our CBD extracts through each stage of the purification process. Only by doing this can we guarantee our products are pure and safe. We also get third party independent lab tests and publish our results online for the world to see. We have nothing to hide. We don’t fake and photoshop out tests. If you ring the phone number on the certificates you can even speak to the lab technician who carried out the analysis. Some companies claim to do it but when you search their website you can’t find anything. Easy profits are made by buying cheap hemp from countries like China, Russia and South America. A consumer has no idea of the seed strain, type or quality or whether they used pesticides or chemical fertilizer in the growing process especially if there are no independent lab tests available. While our products may cost slightly more than other companies we believe it’s worth paying a premium price to ensure your long term safety. Look for quality not low prices. it’s more than tempting to grab the most affordable CBD oil you can find; but cheaper is not necessarily better.